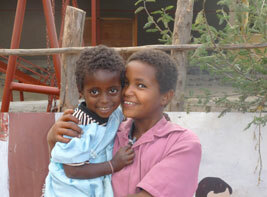 Now with over 200 children, 48 sponsored by Ethiopiahope the Day Care Centre continues to be a huge success. Practically self sufficient with the extra boost of grain sugar and oil, the Centre is the hub of the community. The Centre now employs 6 teachers, 3 cooks, 2 cleaners and a secretary. This year we had a small party for all the children with dancing and bubbles followed by sweets and lollipops. The owner of the local ‘supermarket’ in the main town had a good day when we purchased 200 lollipops and sweets for all the children. But the children had an even better day. Also with your help we sponsor 17 children in main stream school including university.